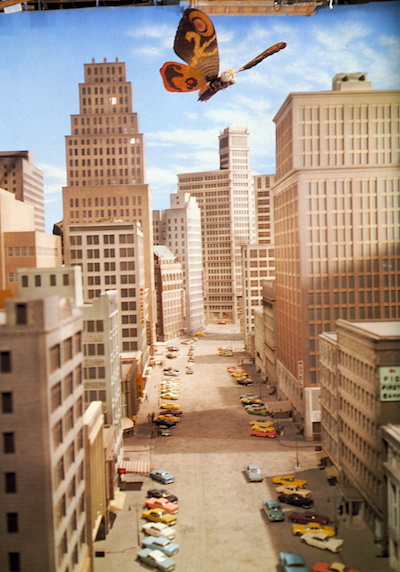 Behind-the-scenes color shot from MOTHRA (1961). ©Toho Co., Ltd. Happy 50th Anniversary to one of my favorite kaiju eiga of all-time, directed by Ishiro Honda with visual effects by Eiji Tsuburaya. Click on this link to read my thoughts on one of the greatest giant monster movies ever made: MOTHRA! You're not getting older, girl; you're getting better! 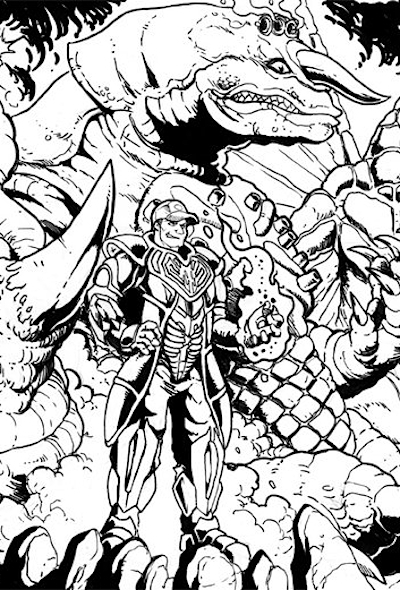 Preview of Matt Frank's illo of the author and Reionyx Team Silver! 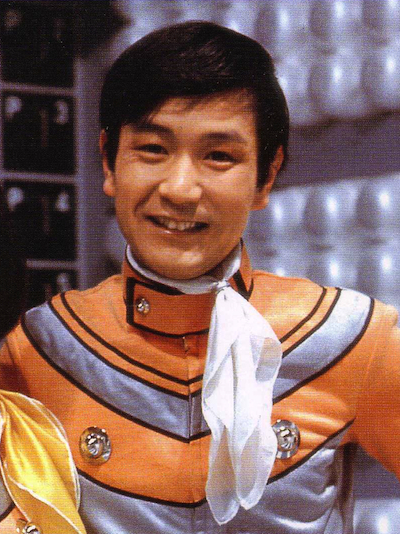 Well, it's that time of the year again in Chicago... G-Fest, North America's only convention devoted to the Kaiju Eiga (or Japanese Monster Movie) milieu returns to the Crowne Plaza Chicago O'Hare in Rosemont, Illinois this weekend — right outside of Chicago — now in it's 18th year (!). This year's guests include actor Hiroyuki Watanabe (Gamera Trilogy, Ultraman Gaia, Karate Robo: Zaborgar), Director and Visual Effects Wizard Shinji Higuchi (Gamera Trilogy, Sinking of Japan, The Last Princess), Miniature Builder and Toy Sculptor Hiroshi Sagae, Android M-11 himself, Robert Scott Field (Godzilla vs. King Ghidorah), and yours truly. Other notable celebrities will include award-winning artist Bob Eggleton (where do we start with this guy? ), illustrator Matt Frank (Godzilla: Legends! ), Damon Foster (Oriental Cinema), and Edward Holland (Monster Attack Team). 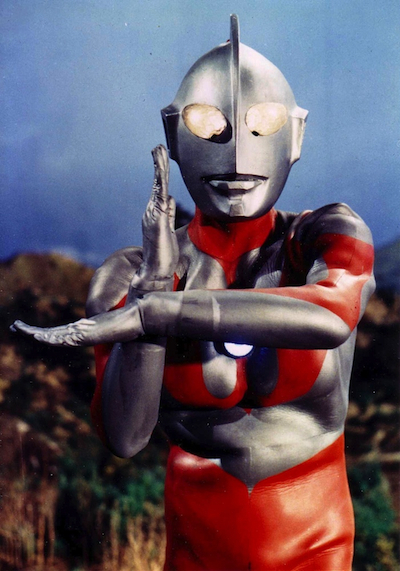 •4:00 pm: 45 Years of Ultraman! For the full scoop on this year's G-Fest XVIII, please visit the official G-Fest website! 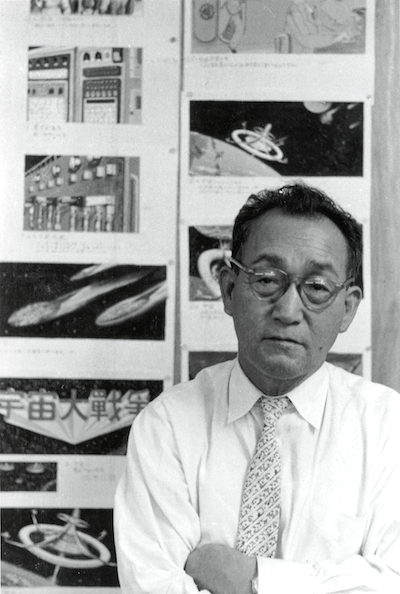 Click here for more about Eiji Tsuburaya, the Father of Japanese Special Visual Effects. 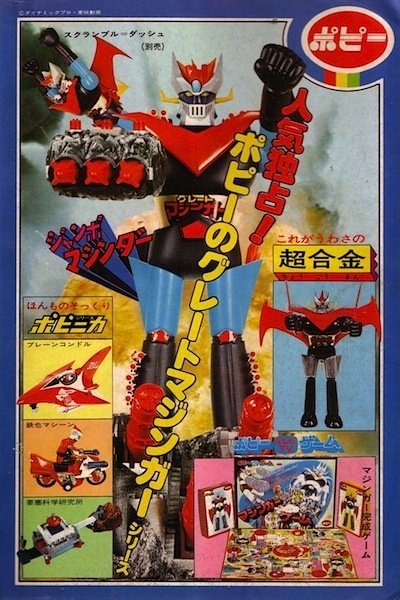 COOL JAPANESE TOY ADS OF THE '70s! FAMOUS MONSTERS' COLOSSAL KAIJU INVASION! Fangtastic Godzilla vs. Ultraman & Goldar cover by Bob Eggleton! Last Fall, celebrated artist (my pal and fellow Godzilla freak), Bob Eggleton, and I were approached by the publisher of the latest incarnation Famous Monsters of Filmland magazine, Phil Kim, to put together an "All Japanese Monsters Issue" akin to the legendary Famous Monsters #114, published in 1975 — which was the best-selling issue in their history. During our two-hour conference call, the three of us geeked out on what made that issue so special, and how this "FM #114 for the 21st Century" could do the same. 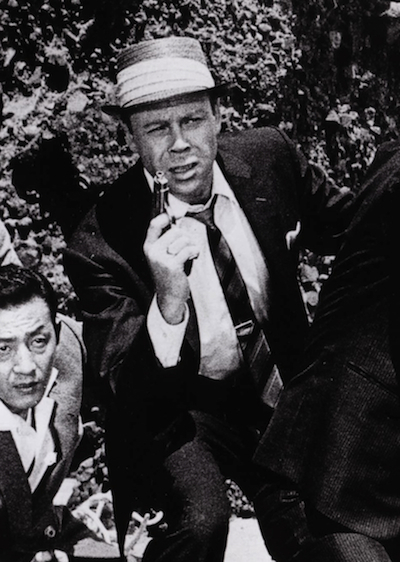 So, as the Contributing Editor, I lined up a veritable "A-Team" of fans who never seem to get enough of the spotlight for their expertise, contributions, and efforts to promote Japanese Fantasy Films and Television outside of Japan. After giving them their assignments, I handed them over to FM's claws-on editor with flair, Ed Blair. All of them did a killer job on their pieces, and together, we created a solid, updated bookend to the 1975 issue. A Kaiju Eiga 101 for a new generation. Our FM #256 A-Team included Edward L. Holland (founder of Monster Attack Team) on KIKAIDA, David McRobie (creator of Xenorama) on the original Gamera films (with a sidebar on Shusuke Kaneko's Gamera trilogy by Jason Varney), Roy Ware (founder of Black Sun) on JOHNNY SOKKO AND HIS FLYING ROBOT, Jim Cirronella (producer of Autopsy of the Dead) on ULTRA Q, Philip Nino Tan-Gatue on how the Super Robot genre spawned Transformers, Artist Matt Frank on IDW's new Godzilla comic, and David Eric Dopko on Collecting Japanese Monster Toys. Bob Eggleton also provides a piece on how much he loves Godzilla (and that's a lot), while yours truly provided ramblings on Eiji Tsuburaya and the Honda-Tsuburaya Godzilla films, snagged an exclusive interview with Godzilla himself, Haruo Nakajima (with some great photos by Chris Mirjahangir and an tremendous title page by Jolyon B. Yates), and got to gush about the thing that got me into this whole mess: ULTRAMAN! We even ran the original Forrest J. Ackerman article which ignited the crazy myth that there were "two endings" filmed for KING KONG VS. GODZILLA — and last, but not least — none other than John Carpenter, the Master of Horror himself, dropped us some kind words about Japanese Monsters! Working on a breakneck deadline, we pulled everything together like Baron Frankenstein, gathered up some terrorific images, let the layout people do their thing, proofs, and then... viola! We're done and the final is off to the printers... and we all waited for the June release date to see just how this Nipponese monster melange has congealed. Then, we received a message from the man at the top of the stairs, Phil Kim, who brings us some startling news: "Before it has even hit the stands, FM #256 is SOLD OUT!" We were stunned. Elated. Flabbergasted. History had repeated itself, and then-some! 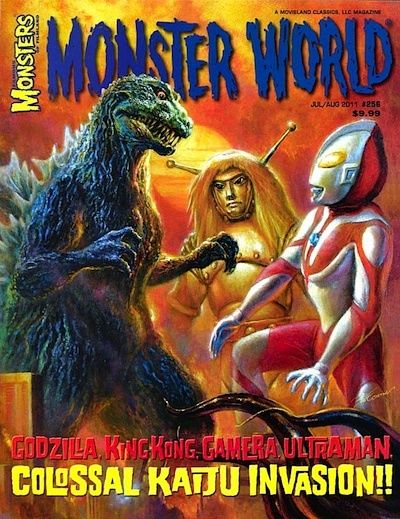 The Newsstand version (sporting a Transformers 3 cover by Paul Gerrard) had sold out from the publisher, and copies of Bob Eggleton Godzilla cover edition (available through Diamond Distributors) were filled and those in the hands of FM's own Captain Company were running dangerously low. And it didn't take long for those remaining 150 copies to fly out into the mail faster than Rodan on a rampage, thus placing FM #256 into the history books as another benchmark for the legendary magazine — grab one while you can! The question now is, can King Ghidorah's lightning strike thrice? Well, as the old saying goes, only time, and a certain Venusian Prophetess, will tell!